Rosemary oil, with its distinctive woody fragrance, has been used for centuries for a variety of health and beauty benefits. So powerful are its healing properties that it is said to have been a favorite of the German-Swiss physician and botanist, Paracelsus. A strong proponent of herbal medicine in the 16th century, he is said to have prized rosemary essential oil due to its ability to strengthen the whole body. It seems he was right – it is indeed a versatile oil with powerful properties. From mental to physical health, from the garden to skincare, here are some incredible benefits and uses for rosemary essential oil. Need a bottle of rosemary essential oil in your life? Try this bottle of Plant Therapy Organic Rosemary Essential Oil. Rosemary oil can take that stress relief up a level – it’s incredibly potent! A 2007 study showed that smelling rosemary oil actually decreased the levels of the stress hormone, cortisol, in the saliva. Excess cortisol can cause oxidative stress, weight gain, high blood pressure, cholesterol and heart disease. We’ve already shared 5 of the best essential oils for treating anxiety with you. Consider rosemary to be a bonus sixth oil. A study published in Holistic Nursing Practice in 2009 found that the use of sachets containing lavender and rosemary essential oils helped reduce the anxiety associated with test-taking. Graduate nursing students, who inhaled the scent of both lavender and rosemary oil before taking their nursing tests, found it significantly lowered their anxiety levels. They scored lower on anxiety measures, and had lower pulse rates, indicating a more relaxed state of mind. If you’re a little overwhelmed, unsure, indecisive or confused, you may find that the soothing aroma of rosemary helps you clear your head. Add it to an oil burner, essential oil diffuser, reed diffuser or simply rub some on your hands and cup over your mouth and nose for up to a minute. Everything will seem so much clearer. You should also feel less tense and stressed. A little rosemary oil may stop you needing to cram the night before a big test. In addition to lowering stress and anxiety, it has also been shown to positively enhance memory. In fact, a 2003 study showed that the aroma of rosemary produced a significant improvement in performance, quality of memory and secondary memory factors in healthy adults. It also helped them remain more alert. A 2012 study backs up these findings – suggesting that the pungent scent can improve speed and accuracy when performing certain mental tasks. Alzheimer’s patients can benefit from rosemary’s fabulous scent too. 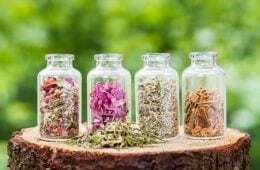 A small study has shown that one month of aromatherapy involving rosemary, lemon, lavender and orange essential oils helped enhance cognitive function in participants, especially those suffering from this particular form of dementia. For full benefits, diffuse the oil through your room, inhale directly or rub over your temples. Rosemary oil is one of the easiest ways to improve circulation in the body. Rosemary oil applied to the skin treats pain and improves circulation, meaning it might just relieve your migraine or throbbing headache. Apply a drop topically to your temples or the aching parts of your head. You can also try rubbing it in your hands and cupping them over your mouth and nose for up to a minute. If your headache is stress related, then by using rosemary you will be alleviating the root cause of the pain. Thanks to its antibacterial and anti-fungal properties rosemary is an important essential oil for giving our immune system a helping hand when cold and flu season rolls round. One of the best ways to do this is with a relaxing and cleansing lymphatic massage using rosemary essential oil. Our lymphatic system helps to clear our body of waste. By massaging our lymph nodes, we can revive a sluggish system supercharging the body’s detoxifying abilities. Rosemary is one of the best essential oils around for stimulating movement and supporting the cleansing action. Dilute a few drops of rosemary oil with a carrier oil (see below) and rub up your arms to the lymph nodes in your armpits. From the center of your chest, rub toward the armpit, and then down the neck. Massage your legs from your feet up to your groin. Rosemary essential oil can be used externally for relief from symptoms of indigestion. If you’re suffering with flatulence, stomach cramps, constipation or bloating give it a try. Combine it with a carrier oil and massage into the stomach. You can also try a bath with rosemary oil for the same effect. Some even say that rubbing the oil on the bottom of your feet will alleviate indigestion! These remedies are much gentler than laxatives or over the counter medications for digestive discomfort. To help relieve the symptoms of a cold or flu – stuffy nose, cough and congestion – try massaging one or two drops of the oil on your chest and throat every few hours. Its antiseptic action also makes rosemary oil useful for respiratory infections. Thanks to its anti-fungal properties, rosemary can be used as a gentle and effective dandruff treatment. And it couldn’t be simpler – pour a few drops of the oil into your shampoo and massage in well. It’s best not to use rosemary oil undiluted on your scalp as it may cause additional flaking. Rosemary has been used for centuries, especially in the Mediterranean region, to stimulate hair growth. One study of 84 people who had alopecia areata, which causes hair to fall out in patches, found that those who massaged their scalps with rosemary and other essential oils daily for seven months experienced significant hair regrowth compared to those who massaged their scalps without the essential oils. Unlike alcohol-based mouthwashes, which can be drying and upset the delicate balance of good bacteria in the mouth, a homemade essential oil wash is both gentle and effective. Rosemary’s anti-microbial properties mean it will kill off the bad bacteria responsible for tooth decay and gum disease and will even rid you of bad breath. Mix one cup of distilled water with 20 drops of rosemary oil. If you miss the minty fresh feel of conventional mouthwashes, you could also add in some peppermint oil. Remember to shake the jar before using. Because rosemary improves circulation which flushes out toxins, it’s an ideal oil to use to banish cellulite – those fatty dimples that are so hard to get rid of. Add two drops of rosemary essential oil and two drops of fennel essential oil to three teaspoons of a carrier oil like olive, jojoba or almond oil. Massage this daily into the problem areas. A rosemary oil lymph massage, outlined above, will also help with cellulite. Rosemary essential oil is one of the best essential oils for removing stretch marks, especially when blended with coconut oil which happens to be another amazing stretch mark remedy. Massage over the marks regularly until they have faded. If you suffer from pimples or acne, then you may need to add a little anti-bacterial action to your skincare routine. We know how bad commercial anti-bacterial washes are for us, but a homemade one using rosemary essential oil is both safe and super effective. Blend rosemary oil with castor oil, or another carrier oil of your choice. Massage in thoroughly and wash off with a warm washcloth. That’s it – your skin will feel soft and should clear up in no time. Avoid buying pesticides from the store. They’re bad for the environment, our health, our wallet…and they’re killing all the bees! Make an all-natural insect repellent instead by mixing 10 drops each of rosemary, peppermint, thyme and clove oil in a spray bottle filled with water. Not only does this mixture kill pests but it will also stop fungus ruining your beautiful plants. Shake before use and apply throughout the garden. It’s safe to use on your vegetable garden too! For more ways to use essential oils in the garden have a look at this post. Rosemary is a fantastic flowering plant, known to effectively repel mosquitos and other bugs, yet it still attracts butterflies to your garden. Mix up a batch of rosemary essential oil and distilled water and keep in a spray bottle – a simple homemade version of DEET, without all the toxic chemicals. Around 10 to 20 drops per ounce of liquid should do the trick. Just remember to shake the bottle and distribute the oil before using! You don’t want to waste your money on store-bought artificially scented air fresheners, which only exacerbate allergies and asthma and usually contain known carcinogens! Instead, freshen up your home with some rosemary essential oil. Add a few drops to some water and spray around the house or even your car (always test in an inconspicuous area before spraying liberally on fabrics). You could also make your own reed diffuser fragranced with this herby scent – check out how to make your own here. Rosemary oil is an amazing oil to have on hand for kitchen countertops and more thanks to its antibacterial, antifungal, antiseptic and antiviral properties. Mix a half cup distilled white vinegar, half cup water and 12 drops of rosemary oil. Decant into a spray bottle and use throughout your kitchen. You can also add some other potent cleaning essential oils to the mix too. Try clove, eucalyptus, lavender, lemongrass, peppermint, sage or thyme. For more ways to use essential oils around the home, try these 50 Surprising Uses for Essential Oils. When using essential oils regularly on your skin, it’s important to mix with a carrier oil first. They dilute the essential oils so they don’t irritate or burn sensitive skin. Some popular carrier oils include grapeseed, olive, jojoba, castor, sweet almond and coconut oil. Half the fun of using essential oils is playing around and making your own customized blends. 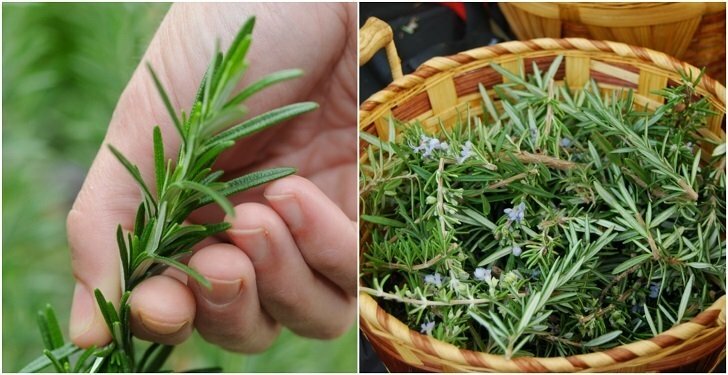 To make your very own rosemary-based blend, check out this how-to guide. Need a bottle of rosemary essential oil in your life? Try this bottle of Plant Therapy Rosemary Essential Oil.